Sleep Tea has been used as a home sleep remedy by millions of people who swear by its effectiveness for making it easier for them to get to sleep, thus providing a higher quality sleep. Anywhere you search on the internet from small blogs to national health websites you'll see people backing its effectiveness. Many different teas are available, each with its strengths and weaknesses. Without reading this guide, you'd find it much more tricky to find the ingredients that work for you the best which not only would waste a significant amount of time, but also money. We will show you the best sleep teas and whether there is any scientific research that supports peoples claims. Celestial Seasonings sleepytime tea is comfortably the best sleep tea that's on the market. It has a considerable reputation in the US, and now in the UK, it is replicating this as it continues to grow rapidly. This 100% natural tea not only does it have a great taste, but it also has a complex combination of natural herbs and plants which can help to aid your sleep quality and reduce anxiety. The herbal tea is also caffeine free and is not only soothing but also is thirst quenching. Unlike other sleep teas, there isn't an overpowering ingredient which often puts people off. The tea is also suitable for both adults and children. You can see the thought that went into the creation of this product. It is also gluten free with no added artificial colours, flavours or preservatives and they have made an effort to create environmentally responsible packaging which cements its place as the superior sleeping tea brand. Yogi Tea has established a strong brand with a large range of different teas. Yogi teas have been inspired by the holistic teachings and healthy living practices of both traditional Chinese medicine and western herbalism. This bedtime tea has been formulated to aid sleep and relaxation. It contains just about every plant and herb that is commonly used to improve sleep quality. This organic, caffeine-free herbal tea also has a great sweet, soothing taste without the added calories that other milky drinks often have. Just make a cup of this tea around 45 -60 minutes before you plan to go to sleep and you'll feel how effective it is at relaxing your mind and body preparing you for sleep. The tea is often used to calm any stomach issues that may be preventing the body from falling off to sleep quickly such as upset stomachs. Hint Wellness is a premium sleep tea designed with the sole aim of improving your sleep quality. It is an ideal alternative to sleeping pills and contains an all natural formulation made from loose leaves and all natural plants to create a great tasting drink. Once the drink has been finished, you will soon find yourself feeling more calm and relaxed and ready to sleep. It's fantastic if you regularly suffer from insomnia or constantly have things running through your mind when you're trying to sleep. The tea has a lovely aroma and has a top quality taste, so no other ingredients such as sugar or milk need to be added. The flavours are not overpowering but strong enough to enjoy. Have Any Teas Been Scientifically Proven To Work? At present, there isn't much scientific evidence that proves tea to be effective at helping you to sleep. However, this doesn't completely rule out its effectiveness because this could be due to there being a substantial lack of research in this area. One thing that can't be doubted is that heated, hot or brewed drinks are extremely relaxing and because it feels good to drink it also puts us in a relaxed state of mind as you wind down before bed. The process you go through to make the team also forms a large part of your overall sleep as it becomes part of your tea ritual. This ritual includes boiling the kettle, finding the sachet of tea, stirring the cup and then finally sitting down in your comfy chair to enjoy the tea. When you keep repeating this process, you're almost telling your mind subconsciously that its time for bed so you naturally begin to feel relaxed and sleepy whenever you carry out this routine. Regardless of what any study says, millions of people carry out a similar routine every day, and it works. Many plant and herbs are routinely used in night time sleeping routines, and several have been used for hundreds of years as natural sleeping remedies. Most of these will be present in night time tea products, so you don't need to go out and source these individually. Chamomile is hands down one of the most common ingredients and will leave you feeling relaxed and calm, ready to sleep and to help you wind down after a long day at work. Another typical night time tea ingredient is Lavender. While its smell is somewhat subjective, its medicinal properties are effective. Upon drinking, it helps to ease and relax your mind to help you easily fall to sleep. It is thought that it has anti-stress properties and can help reduce respiratory issues such as colds, coughs, asthma and bronchitis. Lavender is safe to use by both adults and children and also found in many over the counter sleeping aids. The Valerian herb has undergone research tests that have proven it to have sedative properties. Not only this, but it has been used for centuries to aid both anxiety and sleep. The herb contains phytochemicals that send signals to the brain to tell it that it's time for sleep. You need to drink this for a week to see its real benefits as it needs to build up in your system. Although no conclusive evidence proves Lemon balm can aid sleep, it continues to be used for insomnia and is reported to be more effective when combined with Chamomile and Valerian. You'll often find this in sleep time tea remedies. If you tend to drink hot chocolate, then Carob powder is a more effective alternative. It is very similar to hot chocolate powder except it also provides several health benefits when drunk. Carob powder has a good level of vitamin B which helps to regulate your sleep cycle, so you get a better regular sleep leaving you feeling refreshed and full of energy when you wake. Chia seeds have begun to receive a lot of press attention in recent months. It contains tryptophan which helps to improve sleep. It also contains Omega fatty acids that can be useful for improving your sleep quality. Chinese medicine is extremely complex with thousands of different herbs and plants that have many different uses. The idea behind Chinese medicine is that whatever condition that you're suffering from, there is a specific number of herbs that need to be combined with curing your problem. This creates a custom "magic cure potion." 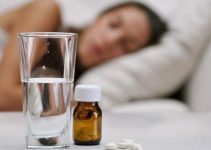 Chinese medicine has been around for thousands of years so no matter the sleeping issue that you're having there will be a formula that you can use. They often look to solve the root of the problem For example if you can't sleep because you're having trouble breathing through your nose, you will be given a formula that solves you nose blockage, so balance is restored. Peppermint is often included in nighttime teas and can help to reduce insomnia that is triggered by anxiety or depression. If stomach pain is keeping you awake, peppermint is great for easing the discomfort, allowing you to sleep. We don't recommend that you drink honey by itself. But when raw honey is added to a drink, it can help the tryptophan chemical in working more effectually to provide you with health benefits. Honey has undergone health studies that have proven its effectiveness at relieving night time coughing. It has also been shown to assist sleep by stabilising blood sugar levels and contributing to the release of melatonin within the body which helps to regulate sleep. So those are our recommendations for the best sleeping tea aids, and now you know to go out and purchase the most effective solutions. These will have you feeling relaxed after a hard day at work. The majority of the best sleeping teas can't be found in store and must be ordered online; however next day delivery is available so you can have in your hands quickly. Let us know what ingredient combinations or products work for you and why.